SEOUL: South Korea is remembered for their run to the 2002 World Cup semi-finals but they are under pressure to create new memories this year in Brazil after an unconvincing build-up. The Taeguk Warriors enjoy an enviable record of qualifying for eight World Cups in a row, a streak only bettered by Brazil, Germany, Italy, Argentina and Spain. But for their supporters, the looming Group H games against Belgium, Russia and Algeria cannot paper over South Korea's struggles to qualify this time when they squeaked home on goal difference. In a bad-tempered final game, South Korea lost 1-0 to Iran and had to endure anxious moments before learning they had finished second in their group despite Uzbekistan's 5-1 defeat of Qatar. Coach Choi Kang-Hee, who had declared he would only manage South Korea through the qualifiers when he took over in December 2011, stuck to his plan and resigned. And in came Hong Myung-Bo, South Korea's most-capped player and captain of the squad that battled their way to the semi-finals, when they co-hosted the 2002 finals. 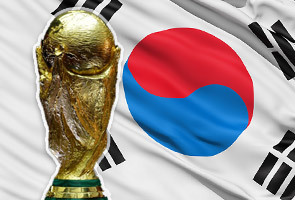 South Korea's 2002 World Cup victories over footballing giants Portugal, Italy and Spain are now a distant memory and the signs under Hong, 44, so far have not been encouraging. In 14 matches under his watch, South Korea were held scoreless six times, and their 15 goals scored includes four against lowly Haiti and three against Mali. Son Heung-Min, a 21-year-old forward, may hold the key to improving South Korea's scoring record. Son made his name netting 12 goals for Hamburg last season, earning a lucrative transfer to Bayer Leverkusen. More goals have come this season for his new German club and he is South Korea's top-scorer under Hong, with four in eight games. Where former coach Choi found little use for Son, the versatile forward is a natural under Hong's style of play, which allows second strikers or wingers to roam behind the primary line of attack. Mainz 05's Korean duo of attacking midfielder Koo Ja-Cheol and left wing Park Joo-Ho will also boost South Korea, along with Sunderland midfielder Ki Sung-Yueng and controversial striker Park Chu-Young.